The costume illustrated is of dark blue velveteen with gray Astrakhan for trimming. It is in two pieces, a jacket which has close coat sleeves and flowing outside sleeves and a pleated skirt. 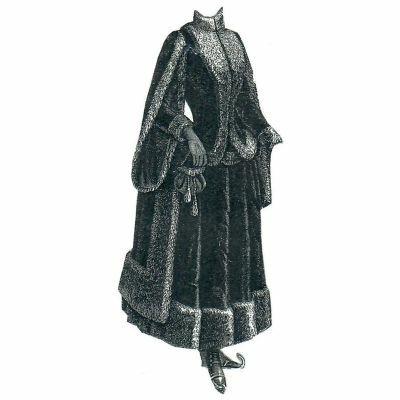 Ageless Patterns (AG) are original patterns from the indicated era and include original sewing instructions from the Victorian/Edwardian/Titanic era and assume sewing knowledge a seamstress would customarily have in the Victorian era.